New York, N.Y. As Harvey Milk, a transplanted New Yorker, pulled the gay and lesbian community of San Francisco together in the mid-1970s, like-minded musicians there formed the world’s first gay and lesbian marching band. New Yorkers took notice and a sister band was born the next year in Manhattan. They marched down Fifth Avenue for the first time in 1980. Fast forward 30 years, when gays and lesbians have more rights but still no equal marriage, and the Lesbian & Gay Big Apple Corps prepares for its 30th anniversary event. Over the winter I enjoyed the band’s performance at Carnegie Hall. Their modern number by Leroy Anderson entitled “The Typewriter” cleverly featured an old typewriter as a percussion instrument. Leroy composed short, light concert pieces, many of which were introduced by the Boston Pops Orchestra under the direction of Arthur Fiedler. Practice, practice, practice took them to Carnegie Hall. I recently met up for coffee with the organization’s president and corporate secretary, Jon Aceto and Andrew Berman. Jon’s day job is teaching English for the City University of New York. Andrew is in marketing. Many have asked: Is there something particularly gay or straight about music? No more than a Polish-American bowling team makes bowling Polish-American. The Big Apple Corps started out as a social organization, and continues today to offer a place where people can make friends — and even fall in love. 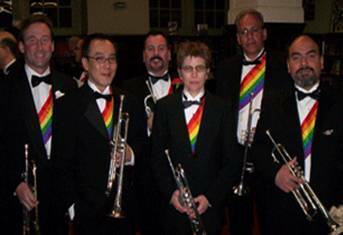 The role that the Lesbian and Gay Big Apple Corps finds itself at 30 is ambassadorial. Pride parades up and down the East Coast fill its calendar, but increasingly the band is also invited to non-pride events. For example — and unexpectedly — the Veterans Day Parade. About 100 people belong to the organization, practicing three hours per week in season. 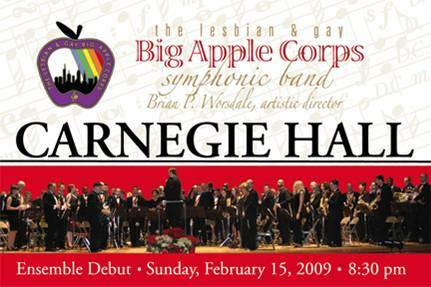 Their Carnegie Hall appearance was the pinnacle of their success in Manhattan, but they also performed in Barack Obama’s Inaugural Parade in Washington, the first and only gay and lesbian group to participate in that historic event. The organization’s members are extremely dedicated as there is such a time and financial commitment to join. 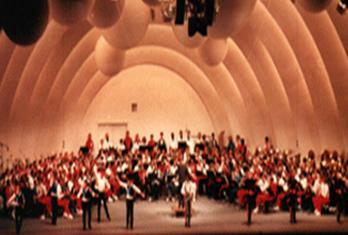 When the group travels, costs can easily climb to $10,000 for the 100 performers. The musicians actually have three bands in one: the original marching band, a symphonic band, and now Spectrum, their jazz band. Notables that have appeared with the origination include New York City Council Speaker Christine Quinn, actor Harvey Fierstein, the talented Rita Moreno, columnist Liz Smith, and playwright Arthur Laurents. 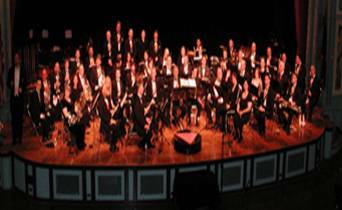 Brian Wordsdale is the symphonic band’s artistic director while Marita Begley is the artistic director of the marching band. Membership is all-inclusive, predominantly lesbian, gay, bisexual, and transgendered. The band welcomes heterosexual players as well. The Big Apple Corps are truly lesbian and gay musical ambassadors. As I witnessed their Carnage Hall debut, I was surprised that I swelled with such a sense of pride. Tibet: Polar Perspectives. Can Both Sides Be Heard?